Did you ever buy a design from the Silhouette Design Store (or maybe download an SVG from somewhere), but instead of cutting it and layering it as vinyl or paper piecing, you want to just do it as a quick and easy print and cut? It's actually pretty simple to turn designs into print and cuts. I like to do this if I'm short on time or need to make a bunch of something like treat bags for my kiddos' classmates (especially since I know they won't appreciate all the work that goes into piecing haha). 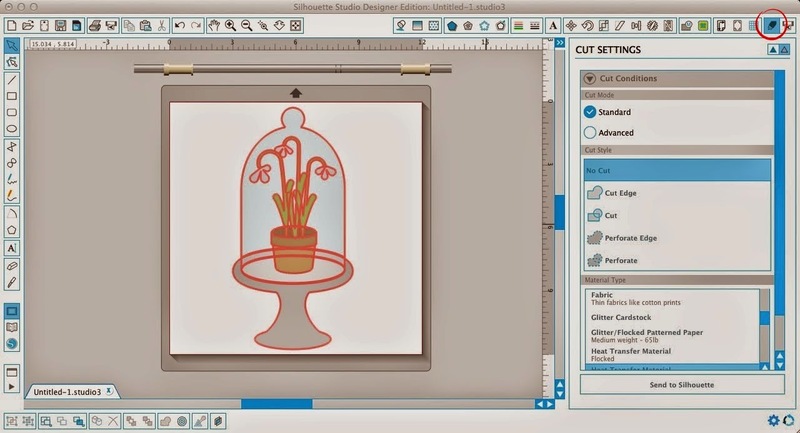 For this example I'm going to use the Flowers in a Bell Jar design which, in my opinion, is one of the best free designs of the week that the Sil Store has ever had. Just saying. That's because it's a cut file and not specifically marked as print and cut. But that doesn't mean you can't use it as a print and cut. You totally can..with a little bit of work. What you want to do is first ungroup all of the pieces so you can fill them in with color. To ungroup Select design > Right Click > Ungroup. You may need to ungroup more than once depending on how your design was originally grouped by the designer. For example you can see that the flowers and the stem are ungrouped from the rest of the design, but not from each other. I need them each to stand alone so I need to ungroup again. You'll know when everything is ungrouped when each piece has its own box around it. If you haven't already, open up your fill tool and click on the eye dropper. 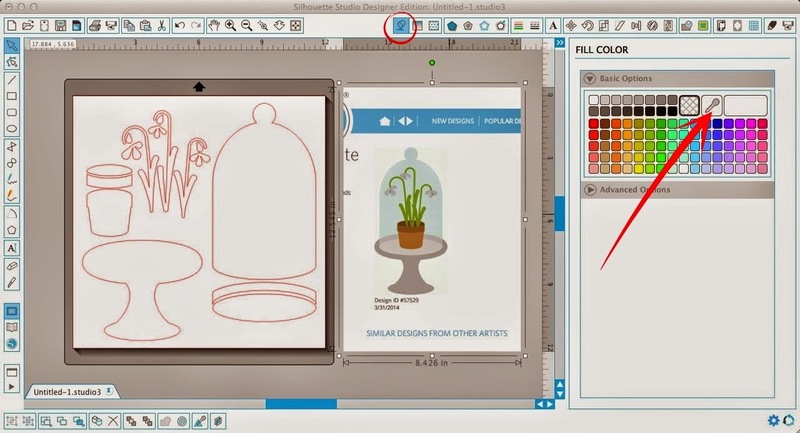 Select the design piece you want to fill and then use the eye dropper to match the color or just pick whatever color you want from the color swatches shown. Repeat for all of the pieces. Once all of the pieces are filled in, you can start arranging them by simply selecting each piece and dragging it into position. If something is 'behind' and you need it in front: select it > right click > bring to front. Now after you have everything in the correct spot select it all and GROUP!! (Select all pieces > Right Click > Group). Don't skip the grouping. If you go to your cut style settings now you'll see every piece still has a cut line around it - as indicated by the bold red line. This is NOT what we want for a print and cut. We're almost ready to print and cut just like we normally would! From here you know the drill...add your registration marks, resize your design if you need to and you're ready for printing! If you're like "WHAT????? is she talking about...I'm a print and cut newbie?!" 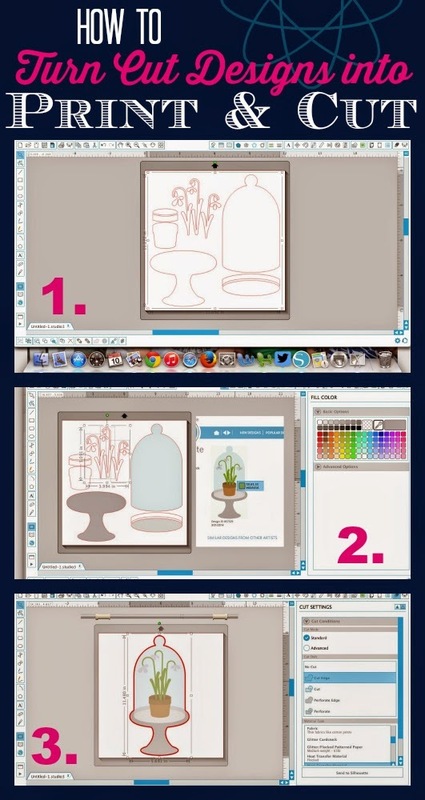 click here for my Print and Cut 101 tutorial to finish up. And that's all there is to turning a Silhouette Studio cut file into a print and cut design. This is my first time here. Literally spent almost 2 hours just reading through. Love love love it! Just about to get my cameo 3, Would jpeg files require any conversion or can they just go into print and cut? Melissa, it is amazing how quickly one forgets things if not done for a while. I had totally forgotten how to convert a cut file to a print and cut, and even how to get the print and cut done, so THANK YOU for having this information out there! I had also upgraded to Version 4 since I had last done one, so I would have been really lost. It was a piece of cake following your instructions.